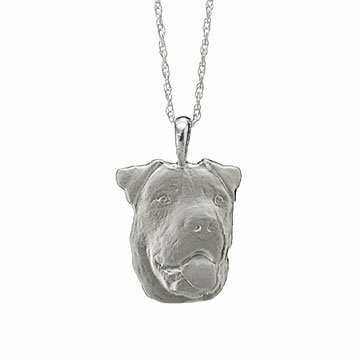 Capture the likeness of a beloved pet with this personalized sterling silver pendant. Capture the likeness of a beloved pet or commemorate one from your past with this unique personalized pendant. Joel Ragan began creating sterling silver portrait pendants by making one of his late brother as a gift for his mother. Now, a favorite photo of your cuddly companion can be transformed into a true-to-life 3D likeness. It's a tangible way to honor a cat, dog, or other pet that has enriched your life in countless ways. Handmade by Joel Ragan in Missouri. If you feel like you cannot find just one photo that fits your pet's personality, feel free to submit multiple. We will choose the best image to work from. When choosing or taking a photo, make sure it is a large size and that it is not out of focus. Lighting is also very important; if you take a photo with the flash on, it tends to flatten your image. Natural lighting is always best if you face your pets towards the light source, and it shows off your pet's true colors. Get on your pet's eye level. Many people will take a photo of their dog or cat while standing above them. Take a seat or kneel down to their level. Probably the most important detail is your pet's eyes. If they are glowing (from the flash) or are dark from shadows, we can only guess are what your pet's eyes look like. The eyes are what really bring your pet's portrait to life, so try to get at least one good snapshot of them. Joel Ragan created his first charm as a tribute to his brother who had passed away. He gave it to his mother, and her gratitude at the unique gift sparked the beginning of Joel's line of sterling silver likenesses. Within a few months, he was refining the way he was making the charms. The originals were a 2.5-D relief created from a photo. But he continued to work on the process and, over the years, has developed the system he uses today: a truly 3D charm created from a single photo. When Joel expanded his line to include pet portraits, the results were as satisfying as his likenesses of people, offering customers tangible pet tributes that go beyond photographs. Clean with soft damp cloth. Use silver polish sparingly. This is a made-to-order item. You will be required to send a photo or document to complete your order. This item typically ships 4 weeks after the artist receives the photo(s)/document(s).At this time, this item cannot be shipped to P.O. Boxes or to APO/FPO or US Territories. Contact custom@uncommongoods.com with any questions.